The cabinet reshuffle is the lead for most - an exercise the Daily Telegraph describes as "the night of the blunt stiletto", a reference to Harold Macmillan's Night of the Long Knives. It says Theresa May's hopes of asserting her authority with a cabinet revamp fell flat after senior ministers derailed her reshuffle by refusing to move from their jobs. According to the paper, Health Secretary Jeremy Hunt faced down the prime minister when she asked him to become business secretary - while the education secretary, Justine Greening, dug in her heels when asked to move to work and pensions. "No, Prime Minister!" is the Daily Mail's headline. It says Mrs May's New Year reshuffle "unravelled", denting her hopes of putting the disasters of 2017 behind her. The Financial Times says it was "accident-strewn" and for The Times, it was a "shambolic" reshuffle that laid bare Mrs May's lack of authority and revived questions over the competence of her administration. 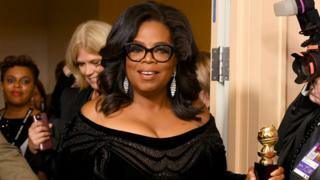 The papers are enthused by reports that Oprah Winfrey is considering running for the White House following the reception to her speech at the Golden Globes on Monday. The Telegraph says her odds of becoming the next US president were slashed dramatically after the electrifying speech tackling the entertainment industry's sexual harassment scandal head on. The Times says Ms Winfrey arrived on stage to receive a lifetime achievement award, but left it as a potential presidential candidate. It looks ahead to the possibility of what it calls an extraordinary contest in 2020 in which two former television hosts - Oprah and Donald Trump - battle to be the leader of the free world. There's strong criticism of BBC pay following the resignation of its China editor Carrie Gracie, in protest at what she called an "indefensible pay gap between men and women" at the corporation. For The Telegraph, what this episode has demonstrated is that pay inside the BBC is out of control. In the Sun's view too many stars, presenters and managers pocket obscene sums, given that they are funded by a compulsory levy. The Guardian says there's nothing unusual about pay secrecy, but a fair society depends on a high degree of transparency and accountability, and the BBC is a public service organisation with a particular obligation to stick to the letter of the law on equal pay. Several papers raise a toast to Blue Peter, which has been named the best children's television programme of all time by a panel of TV experts in the Radio Times. It beat Grange Hill, which came second, and Newsround, which was in third place. The Mail says Blue Peter - which celebrates its 60th anniversary this year - was once staple teatime viewing in households up and down the country. The Guardian says it received 1,000 letters a day. Tim Vincent, a former presenter of the show, writes in the Sun that the achievement recognises its special place in generations of hearts. As the paper's headline puts it, Blue Peter is the Number One they made earlier.